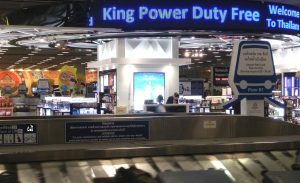 Buying duty free on arrival is a little known concept to European or North American travellers who have always expected to buy their tax free goods on departure and carry them around the globe for export. But there are two countries in Europe where you can also buy on arrival, Switzerland and Norway. At Os lo’s Gardermoen airport, inbound arrival duty free shopping has been available for over 10 years, breaking the traditional convention of outbound selling in the departure lounge. Yesterday the Norwegian airport authorities and their partners Travel Retail Norway, previewed their new store in the baggage claim area. With 4000sq metres it will eventually be the largest store in the world to shop for duty free on arrival, rather than on departure. Around the globe, flyers can shop on arrival in most Asian airports, some in China, Australasia and across the Pacific in all of Central and Latin America. In Brazil and Argentina more than 30% of the trade is carried out in stores on arrival in the baggage claim area. In fact, the Brazilian duty free allowances allows for the purchase of up to 12 litres of whisky when purchased in the arrivals hall and you can see the cases stacked high, ready for the arriving passengers. Overall, the world is starting to grasp the practicality of the concept of buying on arrival. Not only does this facilitate e-commerce for the stores, who have now introduced online duty free shopping, but this leads to easy collection of the goods too. Airlines are also waking up to the idea by introducing home delivery for some of the products they sell on board. Technically these delivered goods are neither tax or duty free, the airlines just pay the tax for you, so they can deliver to your home. 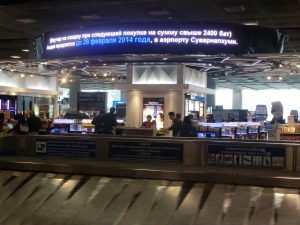 Next year, it is slated that Russia and their Eastern European neighbours will also introduce shopping on arrival in airports and Japan has also decided (again) to explore the idea. Clearly the traveller is moving online and is pre-planning the journey in advance, whilst seeking quick and easy solutions to smooth this journey, including shopping. Consumers looking for duty free bargains are seeking the best prices by comparing in advance. These arrivals facilities add to that convenience and Oslo airport has seen the opportunity and grasped it with their giant new store. To check where also you can buy on arrival and the duty free allowances for that country, check before you fly!